I’ve been fiddling with this idea for a while – instead of making new geomorphs in the classic style that I started drawing back in October of 2009 (almost six years ago! ), I’ve been considering a different style that fits on a 2.5 x 3.5 inch card (being a standard poker card. Since I spent yesterday drawing up a bunch of new geomorphs in that classic style (they’ll show up on the blog sometime next month most likely), I figured I’d finally pull out the proof of concept for the poker deck geomorphs. This is a quick proof-of-concept piece. Based on what I learned working on this piece, I need to change a few processes (get rid of the card border and extend the hatching, allowing the border to be created by the trimming of the card instead of being drawn on… and probably standardizing the hatching into a background layer that I can just lay down new map segments over) and I could probably put together a full deck of these in about a month or two. Interesting! Thinking of align them thematically with suits, something special for the honorary (is they called that in English?) cards, or just a fantastic 52 set? The codes would be useful when you prepares layouts in advance…. I’m thinking either a straight 52 card deck (MAYBE with non-map cards for the aces), or possibly a 78 card Crown & Anchor deck (because you just don’t see enough Crown & Anchor decks these days) with the six aces being non-map cards. …and of course you are going to have a way to get hold of them as a preprinted deck that I can buy from you…right? Right? RIGHT? I mean, erm, that would be great if you could do that. Doubly so, make it happen and I’ll buy it. Let me add my voice to the growing clamor: I would so buy a deck of these. This would make a great Kickstarter IMHO. I would definitely buy a deck. Assuming that the designs go to the edge of the cards, you could create random dungeons of any size by shuffling and dealing. If you start with the cards face-down, and turn them over as the party moves from one to the next, it would be a great way to progressively reveal the map. You could also introduce themes as in “Diamonds = fungus caverns”. As Schedim said, the value of the card could have some sort of meaning – ie. more complex or with water features. Jokers could be “wicked edition” sections. What do you put on the non-map cards? Reference material. Not good if the aces are needed “in play”. A KS would be cool. There is that current KS – from D20Entertainment, IIRC – where they randomize dice using paired card decks (of 60 cards each) by adding a few new card types: wizard, rook, etc. I was thinking the Aces would be more “traditional” and have a large cross-hatched version of the suit in the middle of the card. But I’m not set on anything yet. Suit colour could indicate a level change. A non-stair change (ie. a vertical shelf drop) could occur in a coridor – or a sloping passage could be assumed. Direction up or down could be diced for or determined by card value, perhaps with ascending values descending into the depths…. Great idea, but I would still rather buy a deck of your square geomorph cards. The problem is that I don’t… like… those maps anymore. That’s stuff I drew a long time ago and the style just isn’t up to what I draw these days. That said, I could probably go ahead with this anyways. But the price will be a lot higher than the poker cards being discussed here because I would have to go with a PoD company that supports 2.5″ square cards – so we’re looking at roughly $10 my cost on a deck of 100 cards. Do you think a deck of 100 geomorphs would be sellable at $20 a deck? Can’t speak for anyone else, but I’d buy a deck at that price. This is very cool, I love this idea! But what about the joker cards? Gotta make jokers! Agreed, while in the same general vein of ideas, the end results are quite different. 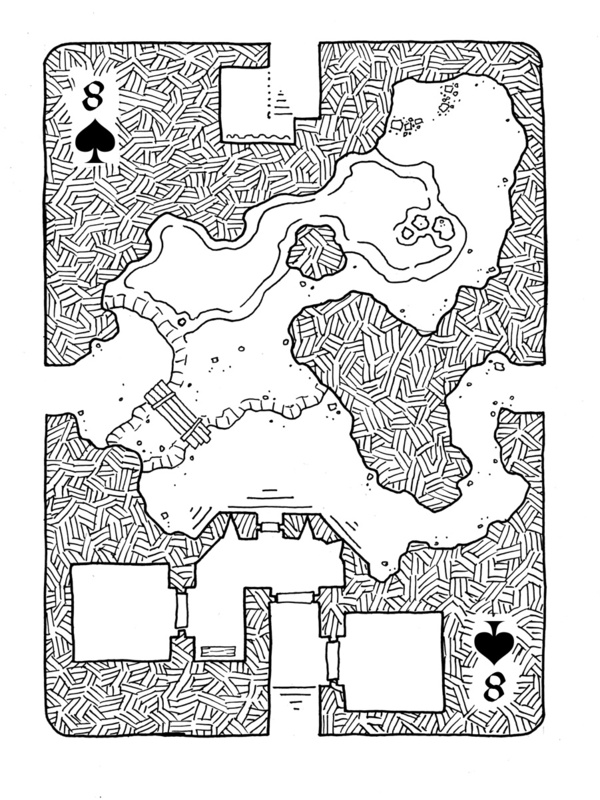 This will be both a functional deck of cards (four suits, 13 cards per suit) and contains geomorphs instead of specific rooms and passages and similar tiles. Definitely kickstart this! I’d buy a handful. Great little presents for my nerd-type friends. Shits and giggles are a missed opportunity. I would back a deck like this on Kickstarter right away. Agreed, throw this on Kickstarter and you’ll be gold! It will be going up on Kickstarter, but not before I know I’ve got my plate cleared enough to handle it. I’m still behind on my commission work by a significant number of maps, and have to keep ahead with the blog maps also to keep paying rent. Once I’m caught up I’ll start working on the first suit for the deck so I know how long it takes to finish of one suit. But I expect that in about a month, maybe two, I’ll have that first suit done. Then I’ll launch the kickstarter. There WILL be a kickstarter on these.